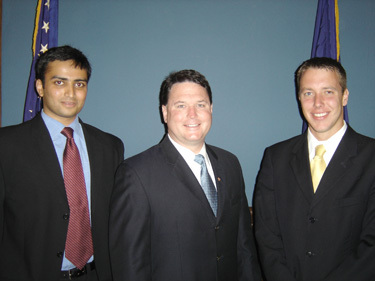 Wabash College students Andrew Wells and Abhi Shah spent 12 weeks of their summer as interns for Indiana Secretary of State Todd Rokita ‘92. The Indiana Secretary of State Fellowship Program is a summer-long internship that selects four undergraduate students from around the state and allows them the opportunity to experience state government first hand. Wells and Shaw spent three weeks in each of the offices divisions which are Elections, Securities, Business Services, and Executive Offices. The fellowships were funded from the office’s operating budget appropriated by the General Assembly. "The fellowship program has given me the opportunity to meet and work with government officials on a daily basis. It has allowed me to gain the experience necessary to excel in a stressful work environment" Senior history major Wells said. "Andrew showed hard work and dedication as he displayed his leadership and ability to work in an environment that can be stressful yet rewarding," Rokita said. "He truly has been a valuable addition to our team this summer as we continue our work to make this office a national model." Wells is a member of Sigma Chi Fraternity, member of Student Senate, Sphinx Club and the swim team. He graduated from Jay County High School in Portland, In. Wells spent the duration of his summer creating a plan to implement the office’s new Core Values program. While his colleague and fellow student Shah spent his time researching and creating an informal brochure for the Voter ID law. "Abhi is an accomplished student with a keen intellect," Rokita said of Shaw’s involvement and performance in the fellowship. "Abhi’s creativity, initiative, and stamina for hard work have made him a valuable addition to our team as we continue out work to make the Secretary of State’s office the finest in the nation." Shah serves as president of Legalis and is active in College Democrats, Habitat for Humanity and a member of Sigma Chi Fraternity. Last summer Shaw worked as a legislative intern in the Washington D.C. office of Senator Evan Bayh. He is an Indianapolis native and graduate of Lawrence North High School. "It has been and honor and a privilege to work for Mr. Rokita. My time as a Secretary of State Fellow has given me an unparalleled view of how state government works and has served as the perfect corollary to my time in Washington, D.C." said the senior political science major. "Working on both sides of the political fence has allowed me to take an academic approach to politics, with an emphasis on public policy. I am thankful to Mr. Rokita for his bipartisan approach to getting things done." Both Andrew and Abhi learned about the fellowship from the Secretary of State website, www.sos.in.gov. Students are encouraged to visit the website to gain more information. Sexton is a Wabash College junior and English major. On main and student homepage: Shaw looks over a project with the Secretary of State.